Leading up free is something I like to have going good on the start. It helps avoid a lot of problems on down the road. Remember, if there is resistance on the ground, there will be on his back. In other words, if the horse isn’t responding correctly to my feel to lead up, my feel with the reins won’t be clear either. Horses have a natural lightness to them. There are times when they’re running in the pasture, they look like they could just float off. It is this kind of lightness that I want to be there when I’m riding. That’s why these basics are so important. If your horse is braced (resistant) on the ground, he’ll be like that when you ride – you’ll hear me say this over and over. First I would have him bending/flexing at the poll as well as side to side. Help your horse learn to back one foot at a time. This helps your horse learn to wait, and really helps him understand your feel. Because feel is all the horse has to go on. When you ask the horse to come forward, you use a firm pull. NOT A JERK! You may have to adjust your body position. Rarely, if ever, do I ask a horse to lead the first few times from directly in front of him. I want to set it up for the horse to succeed, so I will stand off to one side. When you first pull on that lead rope, he may want to raise his head and neck. That’s okay for now. We have already taught him the feel to lower his head while standing and he won’t forget it. As soon as the horse moves his feet, give him slack. Sometimes if you see the horse adjust his weight (like he’s thinking of stepping) you can give him a release then, and it will have a lot of meaning. The next time you give him a feel to move his feet (lead up), he’s going to be thinking about what just took place and begin to understand the feel to move forward. If you have trouble on one side getting him to lead up, there’s nothing wrong with going to the other side. Sometimes he’ll have an easier time following your feel at first on one side or the other. The main thing here is that he begins to lead up before the slack ever comes out of the rope. This should be the end result. It may take several times at this, depending on the person and the horse. Some horses pick this up pretty quick and some don’t. You want to remember to take the time it takes. There would be no room for watching the clock here. I have had colts that had a big problem learning to lead up free, and before they could understand what I was asking them to do, it took a lot of adjusting on my part. Such as, changing my angle/position, to the point that I was almost standing behind them. In the end, they got it and I continued to build on that until I was out in front, and they were leading up free with float in the rope. Here this horse is adjusting to my feel. 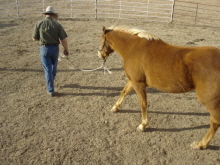 Both directly (through the lead rope) and indirectly (as I’m turning to the left, he is beginning to as well.) Believe it or not, this horse had a real problem in this area at one time. He is on the other side of it now though. 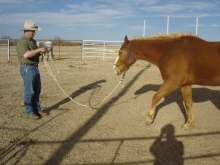 I wouldn’t consider tying up a horse at all that wasn’t taught to lead up free. We have a hard time understanding sometimes how close moving and stopping is in the horses mind. There is a fine line there. 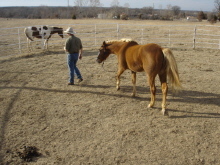 For instance, a lot of horses that have trouble moving out, don’t stop so well. Some horses get really bothered inside while trying to teach them this and it’s these horses that you have to really be there for! For example – they may get stuck (i.e. head/neck up, feet stuck in the ground.) Be careful about just pulling. This shouldn’t be a pulling match. On this type of horse, I might ask him to move (take the slack out smooth) and just as he positions himself to brace or resist, I would offer him slack (reverse psychology,) then try again – as many times as it takes. It’s very important with these kind of horses to be good with your timing and reward the SLIGHTEST try. I know this may sound counter productive, but when I found this, it really made a difference with horses that were already taught to brace or fight. 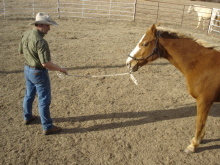 The thing that gets the horse so confused when people just jerk on the lead rope is the release that’s given after the jerk. When you jerk, the horse braces – you release, then jerk again, then release… This release tells him he’s right, but the jerk tells him he’s wrong. In the resulting confusion ,all trust and confidence in the horse/human relationship is destroyed. For questions or comments about leading up free, please contact us.